Did the Chicago Police Department Betray One of Its Own? Internal Chicago Police Department emails revealed to War Is Boring show the department failed to pursue evidence that could exonerate the CPD sergeant who shot and killed a 19-year-old man in November 2016. On Nov. 23, 2016, Sgt. John Poulos shot Kajuan Raye in the back during a foot pursuit. Poulos claimed that he only shot Raye after the 19-year-old pointed a gun at him twice during the pursuit. The next day, Superintendent Eddie Johnson said that the CPD had not found a weapon during a search of the scene. Two days later, Johnson stripped Poulos of his police powers. The superintendent justified the action, in part, because of the unsuccessful attempt to find the weapon. But internal CPD emails revealed to War Is Boring show that, just hours after the shooting occurred, the CPD had information from a trusted confidential informant on the possible whereabouts of the gun allegedly used by Raye. However, CPD detectives declined to search for the gun. IPRA is the Independent Police Review Authority, an independent organization tasked with investigating police-involved shootings. COPA is the Civilian Office of Police Accountability, which will eventually replace IPRA, but was not functioning at the time of the shooting. The reference to “COPA/IPRA” is an indication of a deep misunderstanding of IPRA by the Area South detectives. The informant told the CPD officers that the gun was being hidden in a house, according to an anonymous source. Officers searched the scene of the shooting for the weapon. But no one from IPRA or CPD used the information from the confidential informant to search the house for the weapon that day, according to the source. And the source knows of no search for the weapon since Nov. 24. It seems that the failure to search for the alleged weapon is the product of Area South detectives’ confusion over IPRA’s jurisdiction during police-involved shooting investigations. IPRA’s investigations of officer-involved shootings are to run concurrently with the CPD’s criminal investigation, according to IPRA regulations, and a CPD general order. This means that IPRA investigates the actions of the officer, and the CPD investigates the criminal action by the offender. Thus, in direct contradiction to the Area South detectives, the CPD does not have to receive permission from IPRA in order to search for evidence or to conduct a search warrant, according to IPRA spokesperson Mia Sissac. IPRA does have subpoena powers. But the gun was being hidden in a house, and a search warrant would have been necessary to retrieve it, according to an anonymous source. However, IPRA does not have police powers, and thus can’t conduct search warrants, according to Sissac. In the case of Poulos, this means that IPRA could not have possibly searched for the gun allegedly used by Kajuan Raye. And there was no reason for the Area South detectives to abstain from searching for the weapon. Poulos’ police powers have not been reinstated. The department is currently in the process of firing him over an arrest he failed to include in his application to the CPD more than a decade ago, and his undisclosed co-ownership of an establishment that sells liquor while employed by the CPD. The CPD has failed to respond to repeated requests for comment by War is Boring, citing a rule precluding them from commenting on ongoing police-involved shooting investigations. This story will be confounding to many. The CPD is generally perceived as maintaining a code of silence that compels officers to conceal wrongdoing when a civilian is killed by an officer. The CPD’s code of silence even captured national headlines after a January 2017 Department of Justice report on the CPD roundly criticized the department’s mishandling of police-involved shooting investigations. IPRA was not spared from criticisms of its handling of such investigations. For instance, the report accuses IPRA of sometimes ignoring evidence that clearly contradict the officer’s justification for shooting a civilian. For the CPD, the most infamous recent example of a mishandled police-involved shooting occurred in the aftermath of the Laquan McDonald shooting. Three officers testified that officer Jason Van Dyke shot McDonald after the teenager aggressively lunged at officers with a knife. The video seems to contradict the officers’ testimony. McDonald is seen walking parallel to officers while carrying a knife before being shot and killed by Van Dyke. The three have recently pleaded not guilty to conspiracy charges. But while the public may be surprised to find that CPD detectives did not act on the informant’s tip on the whereabouts of Raye’s weapon, it’s unlikely that many officers within the CPD will share in the surprise. The aftermath of the release of the McDonald shooting video brought unprecedented scrutiny to the CPD, and a wave of sudden reforms. 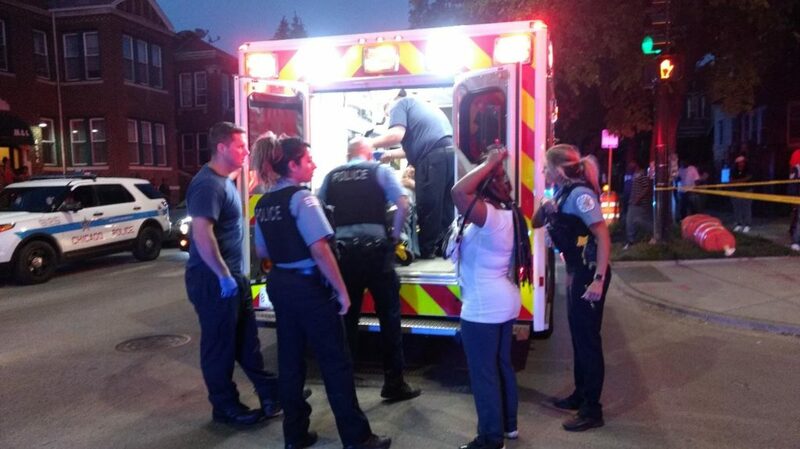 The new atmosphere in the department has caused many officers to feel as though the CPD command staff will not have their backs if a police-involved shooting garners widespread media attention, according to previous reporting by War Is Boring and other news media. From the emails quoted above and other sources, it seems the mishandling of the police-involved shooting of Raye is largely the product of inept and/or careless detectives from Area South, rather than an indication of a shift in the department. However, it is unclear at this point whether the Area South detectives decided to abstain from searching for the weapon on their own, or if they received direction from another source in the department or City Hall. If you have more information on this story, please contact the reporter at Patrick.j.burke6112@gmail.com.